Dapanji (Chinese: 大盘鸡; pinyin: dàpánjī; literally: "big plate chicken") is a type of chicken stew. It is a popular dish that originated in Xinjiang, China. The dish gained popularity in Xinjiang in the mid-to-late 1990s. 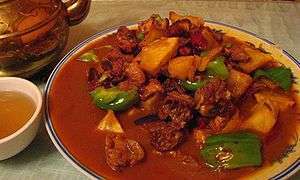 It is said to have been invented in Shawan, northern Xinjiang, by a migrant from Sichuan who mixed hot chili peppers with chicken and potatoes in an attempt to reproduce a Sichuan taste. The dish was served on a big plate by restaurateurs along the Xinjiang highways as a quick fix for hungry truck drivers who often arrived at an odd time of the day. Its rich flavor and heartiness quickly made the dish a favorite of the region, and the dish then spread to the rest of China. The main ingredients are chicken, bell peppers and potatoes, cooked with onions, garlic, ginger, chili peppers, ground cumin, star anise, ground Sichuan peppers, cooking oil, also optionally soy sauce and beer. The chicken is cut into bite size pieces (usually unboned), sautéed with spices and coarsely chopped vegetables, and simmered in broth, providing a savory and spicy casserole-like dish. It is usually served with latiaozi (hand stretched noodles) or lamian (laghman, lamen, ramen), and shared by family and friends in a communal manner. Other variations of the dish may be served with naan (馕包大盘鸡), a staple bread widely consumed in Xinjiang, usually served baked or roasted in Xinjiang restaurants and other places. With the sauce, the bread becomes very soft and moist, producing a melt-in-the-mouth savoury texture. Wikimedia Commons has media related to Dapanji. ↑ Nate Tate, Mary Kate Tate (2011). Feeding the Dragon: A Culinary Travelogue Through China with Recipes. Andrews McMeel Publishing. p. 243. ISBN 978-1449401115.